Three activists from Eastern Europe share their analysis of the advances of fundamentalist and fascist forces across the region. How are anti-right forces operating in Eastern Europe? How are they gaining support? What are the impacts for gender justice and human rights in the region? What does collective resistance look like? Olena Shevchenko is a human rights defender and educator from Ukraine whose focuses are LGBT rights and women’s rights. She is Executive director of Insight, an organization working for rights of LGBT persons in Ukraine and internationally, board member of ILGA-Europe and Co-Chair of the anti-discrimination coalition in Ukraine. Florin Buhuceanu is a Romanian human rights activist working at the intersection between LGBT rights, sexual and reproductive rights, and freedom of religion. He leads ACCEPT- the national LGBT rights organisation, and ECPI - a human right foundation focusing on non-discrimination and reproductive justice. From 2015, he serves as a board member of ENORB-European Network on Religion and Belief, and as member of the Advisory Panel of the EU Fundamental Rights Agency (FRA). Kasia is part of the Resourcing Feminist Movements initiative at the Association for Women’s Rights in Development (AWID). She is based in Warsaw, Poland, where she engages with struggles for sexual and reproductive rights and supports the work of the first Polish Feminist Fund. Before joining AWID, Kasia led policy and advocacy work on women’s human rights for ActionAid and Amnesty International. 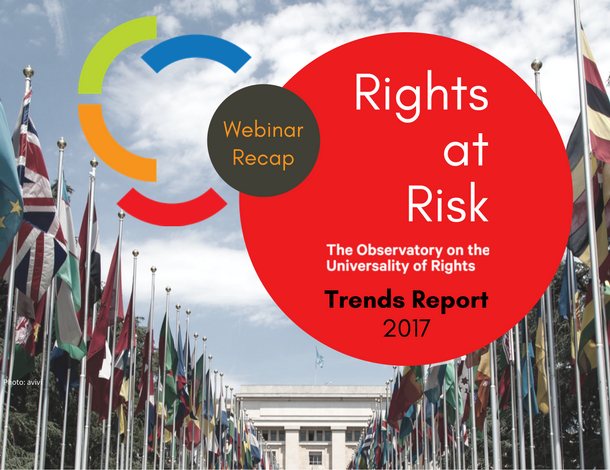 This is the third webinar of the #RightsAtRisk series, discussing the findings of the Rights at Risk report from the Observatory on the Universality of Rights (OURs). This series aims to put light on our collective resistance at the local and international levels.